I recently received Honorable Mention in the 2015 "Yellowstone Forever" photo contest, the first global photography contest focused specifically on Yellowstone National Park. 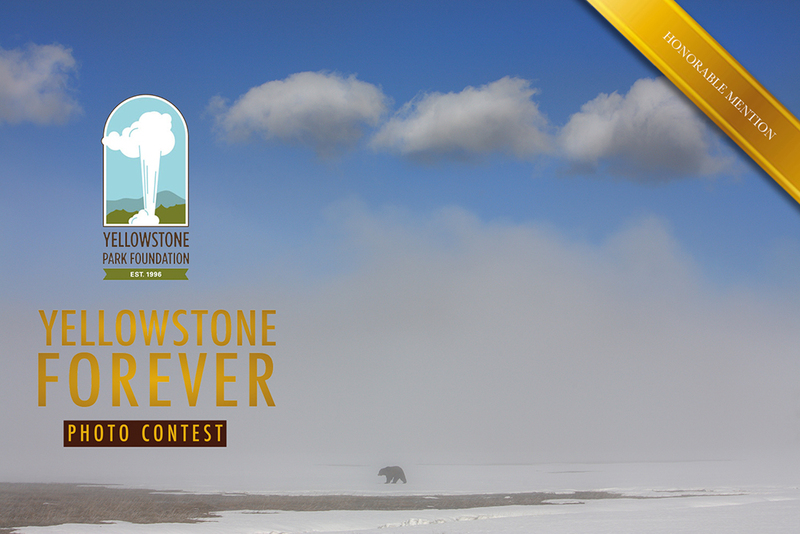 The contest was put on by Nature's Best Photography and The Yellowstone Park Foundation. Yellowstone is a special place to many, including myself and remains one of my favorite places in the world to take pictures. I've spent a lot of time within the boundaries of the park and have shot thousands of images. I'm Very humbled that my image "Cloud Walker" was chosen by the judges to place amongst the over 11,000 images from 31 countries submitted for this competition. To learn more about this contest visit the YPF Contest website here. For the full listing of winners and finalists click here. My image "Cloud Walker" is one of my all time favorite photos. It was taken early morning in Yellowstone in some of the most fantastic conditions I've seen. A very thick layer of fog was stuck to the valley floor below a bright blue April sky. I Can remember looking out at this scene and thinking it felt like being on a cloud. It was a very dream like atmosphere. I knew the conditions wouldn't last long and was just hoping any kind of animal would come along that I could include in the composition. To my absolute delight, a grizzly bear, who would have been fresh out of hibernation appeared out of no where and made his way over the snow and right below a formation of really interesting clouds that had formed in the sky above the fog. When I saw the bear was going to walk directly under the cloud formations in the sky I quickly switched my telephoto lens to something much wider so that I could capture the bear in this otherworldly environment instead of just focusing straight in on it. The bear was gone just as quickly as it appeared. Not long after that the fog burned off and the magic moment was gone. I felt really really lucky to have been able to photograph this extraordinary moment. 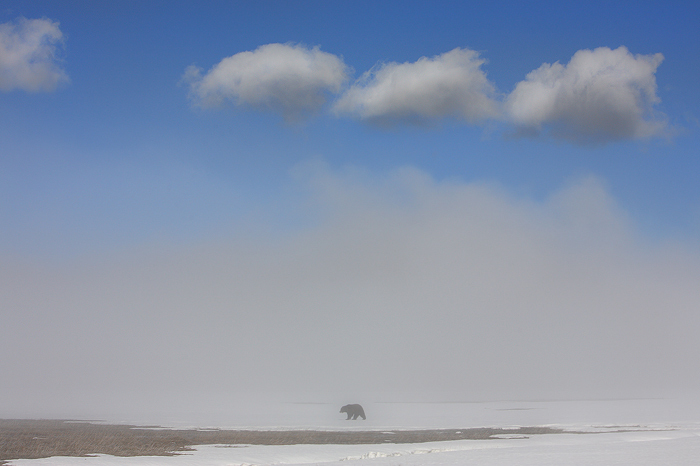 A foggy day in Yellowstone National Park serves as the backdrop as a grizzly bear wanders across a snow covered meadow. The conditions on this day were very surreal, with the low hanging fog and blue skies above.